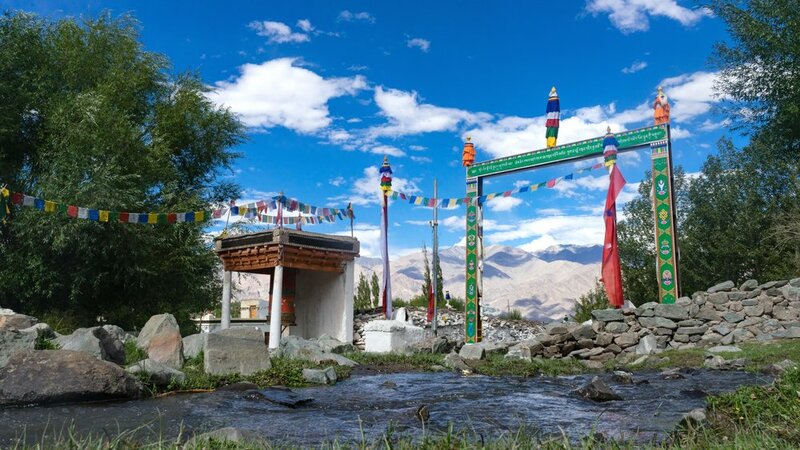 The picturesque, quaint village of Stok lies nestled at the base of the might Stok range with the Stok Kangri peak (6150 m). The valley, home to Stok Chu river is a very green and fertile area. Ladakhi houses are built with sun-baked mud bricks and wooden beams of poplar and willow. The bricks are plastered with clay giving a striking whitewash appearance. The houses are surrounded by their own land with a high mud brick wall. Poplar and willow trees are planted around the edge of the fields to provided timber for building and heat. Irrigation ditches bring water down from the hills and in places there were small metal pumps which, for many, is the only source of water. A walk through the village will reveal that the locals work with a quiet efficiency and are nearly self-sufficient. Their sustainable approach to living is something we should learn to mimic in our daily lives. Stok village that brings alive a way of life that has not seen much change over centuries. As one strolls through white-washed Chortens and mud-brick homes strewn across barley fields, adorned by fluttering prayer flags wielded in the wind, carrying good-will and peace to all sentient beings. It could be arranged for guests to visit a village home for a steaming cup of butter tea or Chhaang (local barely beer). During this time of the year you can see the Ladakhi’s preparing their lands and farms after the winter is finally giving to the warmer half of the year - the growing short season that Ladakh has. Listen to the farmers sing to the Zo’s, and watch the apricot blossoms turn in to little apricots. Wait with the locals for the water channels to start bringing in the snow melt fed streams.